What is OOH? • When one lives in a home, one consumes a « housing service » . • Dwellings are owned by somebody (household, private company, government, special agency) • In market economies, households can own dwellings • Households have two « ways » of housing: – Rent a home from an owner. 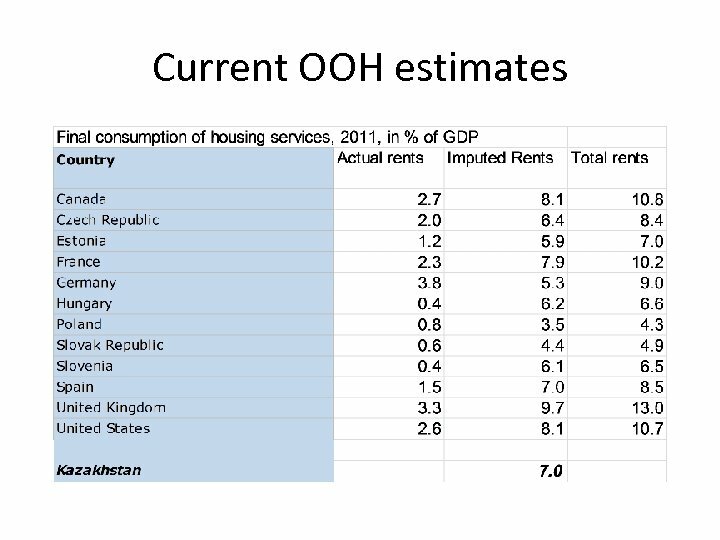 The housing service is measured by the rent. – Own their home and live in it. 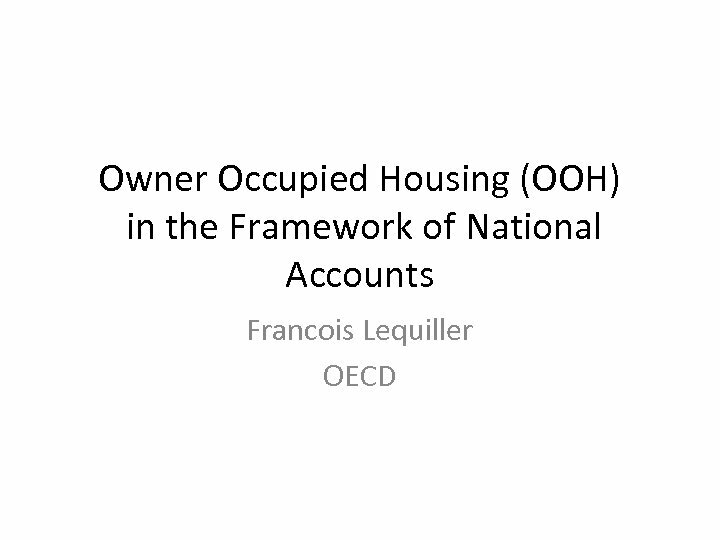 • Owner Occupied Housing service is the estimate of the imputed housing service that households owning their home and living in it produce for themselves. Why OOH and not other services? 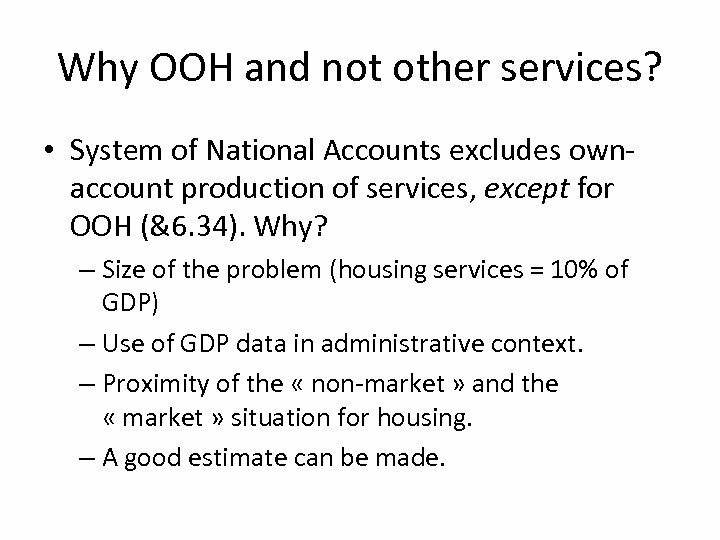 • System of National Accounts excludes ownaccount production of services, except for OOH (&6. 34). Why? 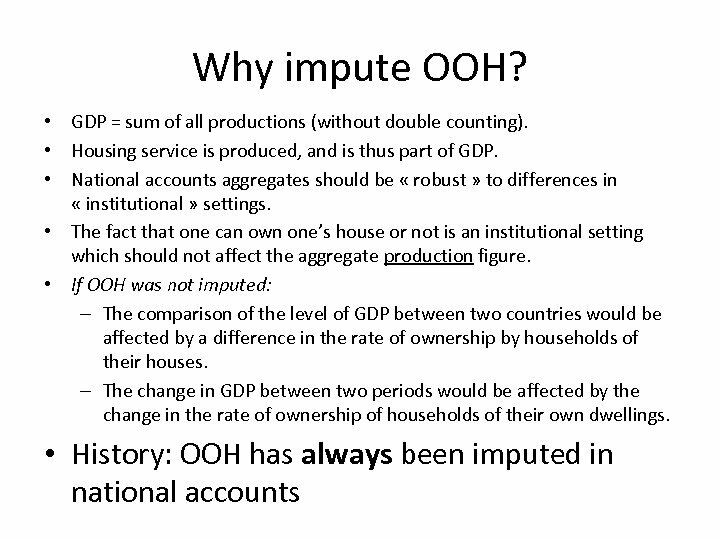 – Size of the problem (housing services = 10% of GDP) – Use of GDP data in administrative context. – Proximity of the « non-market » and the « market » situation for housing. – A good estimate can be made. 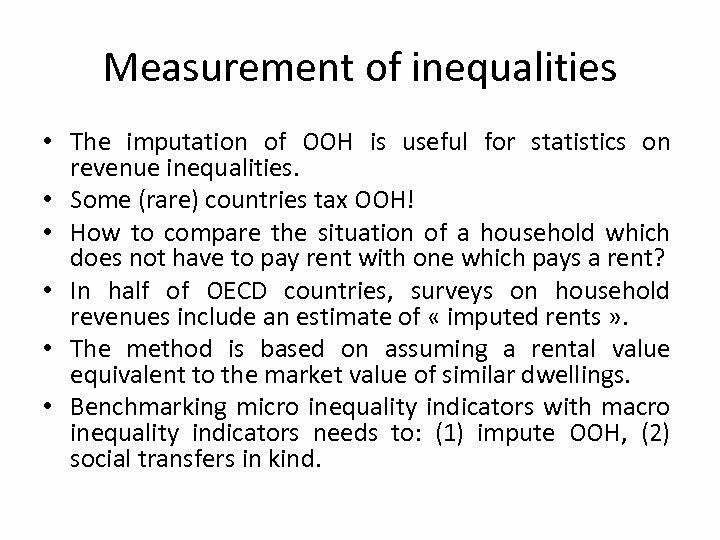 Measurement of inequalities • The imputation of OOH is useful for statistics on revenue inequalities. • Some (rare) countries tax OOH! • How to compare the situation of a household which does not have to pay rent with one which pays a rent? 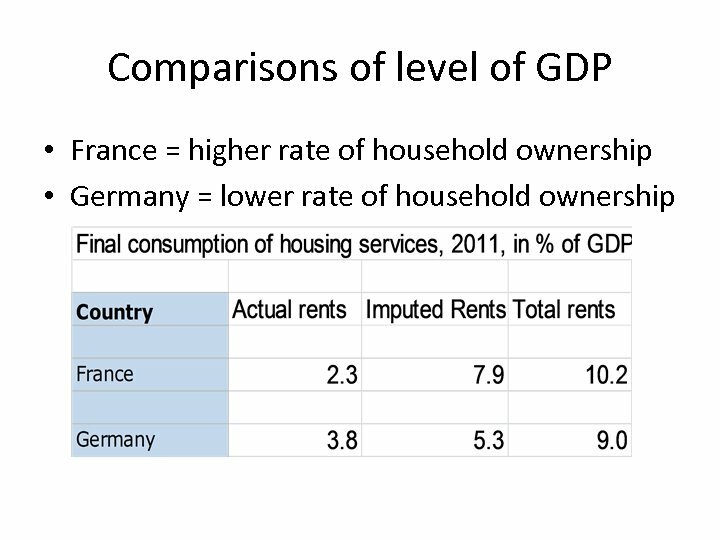 • In half of OECD countries, surveys on household revenues include an estimate of « imputed rents » . • The method is based on assuming a rental value equivalent to the market value of similar dwellings. • Benchmarking micro inequality indicators with macro inequality indicators needs to: (1) impute OOH, (2) social transfers in kind. 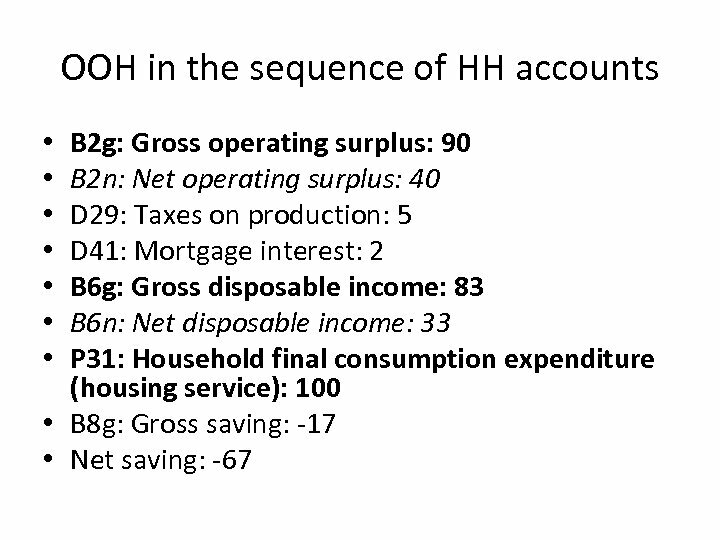 OOH in the sequence of Household accounts • P 12: Output from own final use: 100 • P 2: Intermediate consumption (ordinary maintenance of dwelling typically not carried out by tenants + net insurance premiums): 10 • B 1 g: Gross value added: 90 • P 51 c: Consumption of fixed capital: 50* • B 1 n: Net value added: 40 • B 2 g: Gross operating surplus: 90 • B 2 n: Net operating surplus: 40 IMPORTANT: • OOH is not mixed income (B 3). 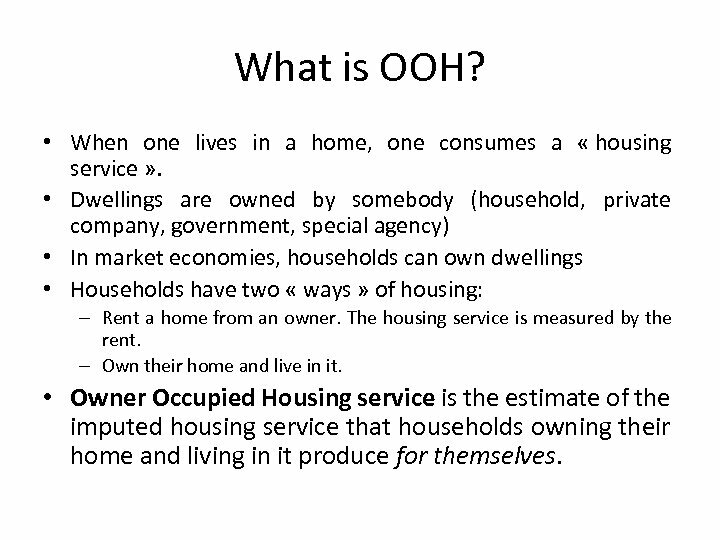 • Operating surplus of households (B 2) is exclusively Housing services (OOH and leasing services; &7. 9) * Parameters: Rent and User cost around 6% of value of capital, Consumption of Fixed capital around 2. 3% of value of capital. 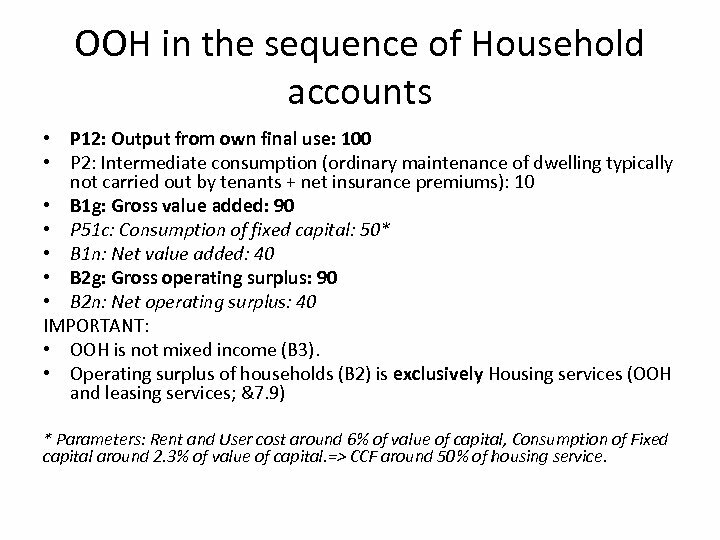 => CCF around 50% of housing service. 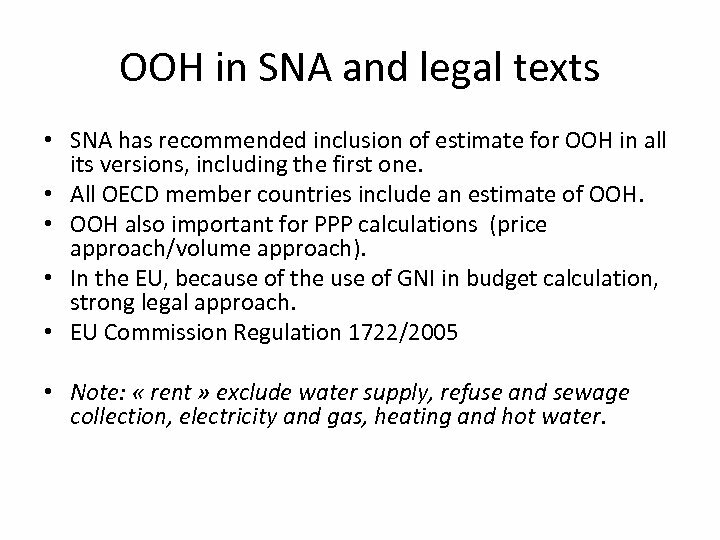 OOH in SNA and legal texts • SNA has recommended inclusion of estimate for OOH in all its versions, including the first one. 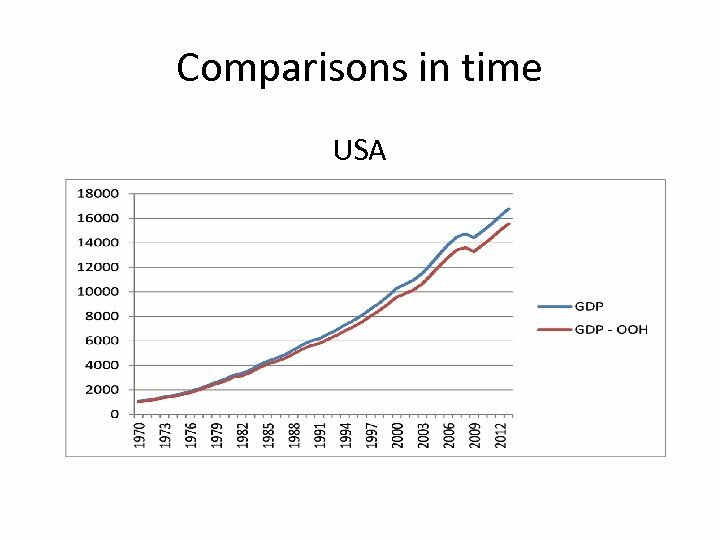 • All OECD member countries include an estimate of OOH. • OOH also important for PPP calculations (price approach/volume approach). • In the EU, because of the use of GNI in budget calculation, strong legal approach. • EU Commission Regulation 1722/2005 • Note: « rent » exclude water supply, refuse and sewage collection, electricity and gas, heating and hot water. 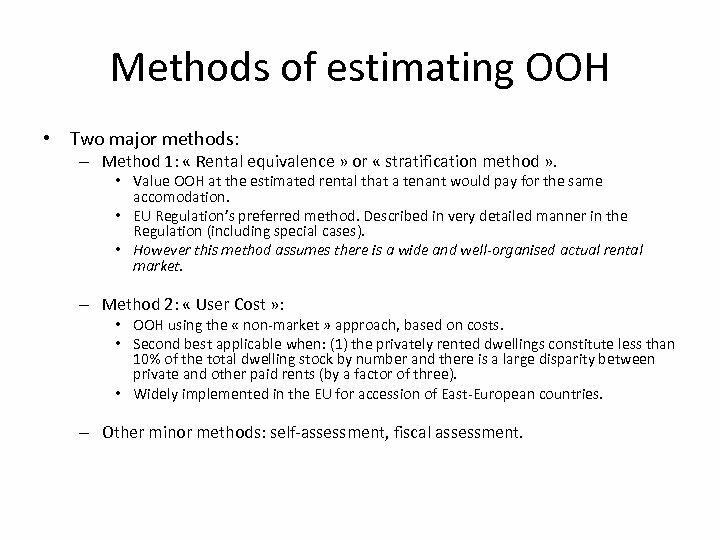 Methods of estimating OOH • Two major methods: – Method 1: « Rental equivalence » or « stratification method » . • Value OOH at the estimated rental that a tenant would pay for the same accomodation. • EU Regulation’s preferred method. Described in very detailed manner in the Regulation (including special cases). • However this method assumes there is a wide and well-organised actual rental market. 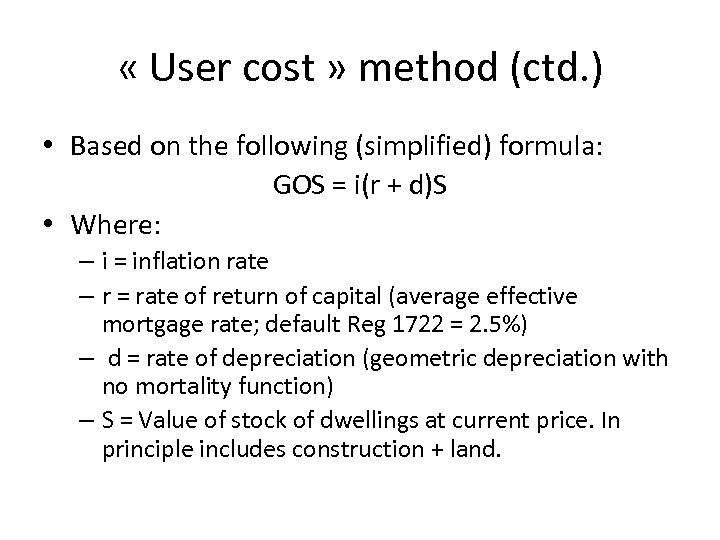 – Method 2: « User Cost » : • OOH using the « non-market » approach, based on costs. • Second best applicable when: (1) the privately rented dwellings constitute less than 10% of the total dwelling stock by number and there is a large disparity between private and other paid rents (by a factor of three). • Widely implemented in the EU for accession of East-European countries. – Other minor methods: self-assessment, fiscal assessment. 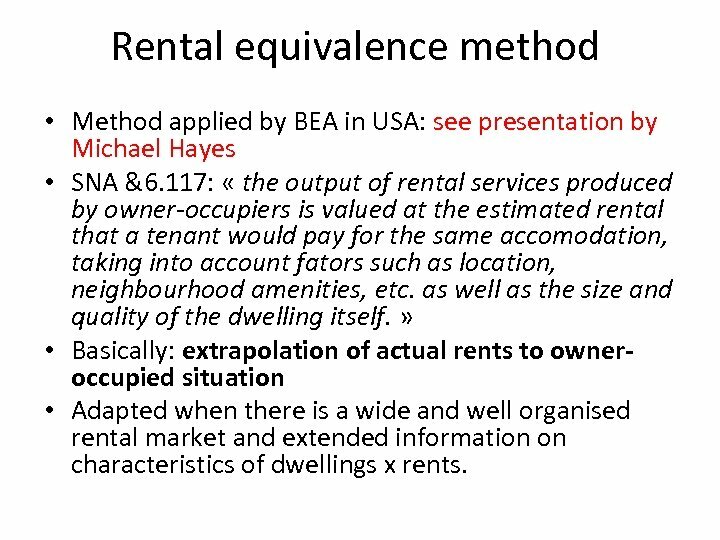 Rental equivalence method • Method applied by BEA in USA: see presentation by Michael Hayes • SNA &6. 117: « the output of rental services produced by owner-occupiers is valued at the estimated rental that a tenant would pay for the same accomodation, taking into account fators such as location, neighbourhood amenities, etc. as well as the size and quality of the dwelling itself. » • Basically: extrapolation of actual rents to owneroccupied situation • Adapted when there is a wide and well organised rental market and extended information on characteristics of dwellings x rents. 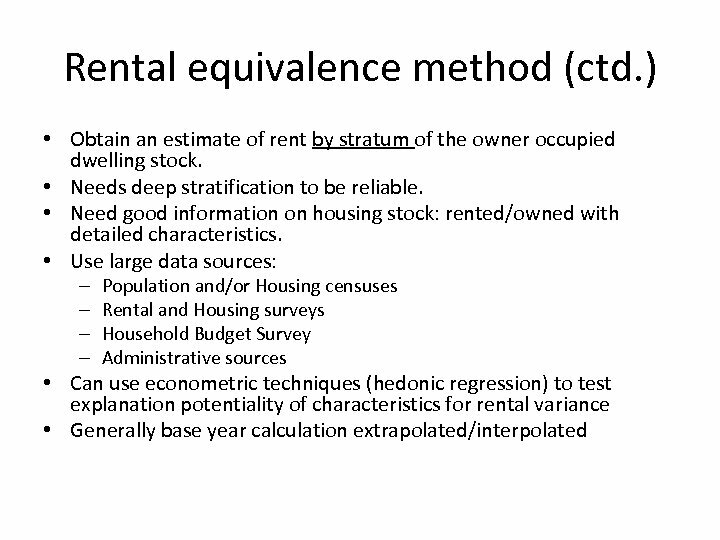 Rental equivalence method (ctd. ) 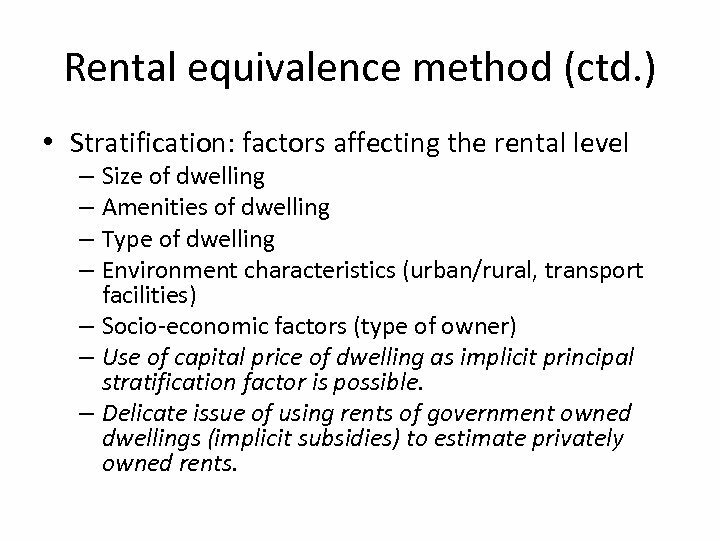 • Stratification: factors affecting the rental level – Size of dwelling – Amenities of dwelling – Type of dwelling – Environment characteristics (urban/rural, transport facilities) – Socio-economic factors (type of owner) – Use of capital price of dwelling as implicit principal stratification factor is possible. – Delicate issue of using rents of government owned dwellings (implicit subsidies) to estimate privately owned rents. 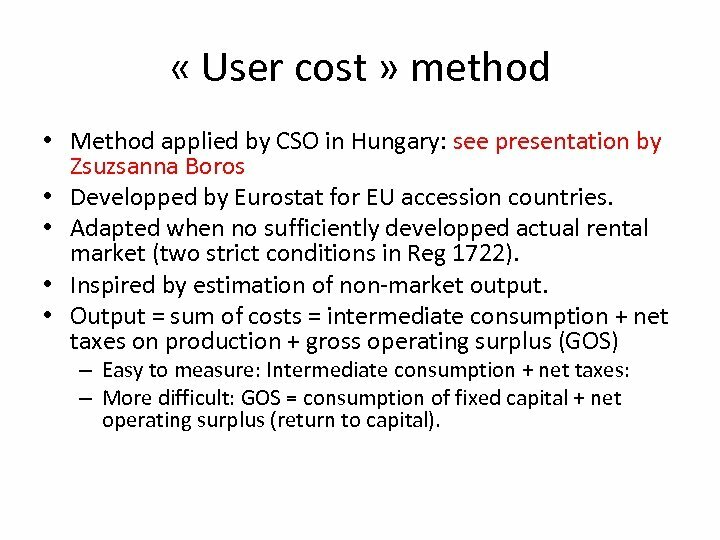 « User cost » method • Method applied by CSO in Hungary: see presentation by Zsuzsanna Boros • Developped by Eurostat for EU accession countries. • Adapted when no sufficiently developped actual rental market (two strict conditions in Reg 1722). • Inspired by estimation of non-market output. • Output = sum of costs = intermediate consumption + net taxes on production + gross operating surplus (GOS) – Easy to measure: Intermediate consumption + net taxes: – More difficult: GOS = consumption of fixed capital + net operating surplus (return to capital). « User cost » method (ctd. ) • Based on the following (simplified) formula: GOS = i(r + d)S • Where: – i = inflation rate – r = rate of return of capital (average effective mortgage rate; default Reg 1722 = 2. 5%) – d = rate of depreciation (geometric depreciation with no mortality function) – S = Value of stock of dwellings at current price. In principle includes construction + land. 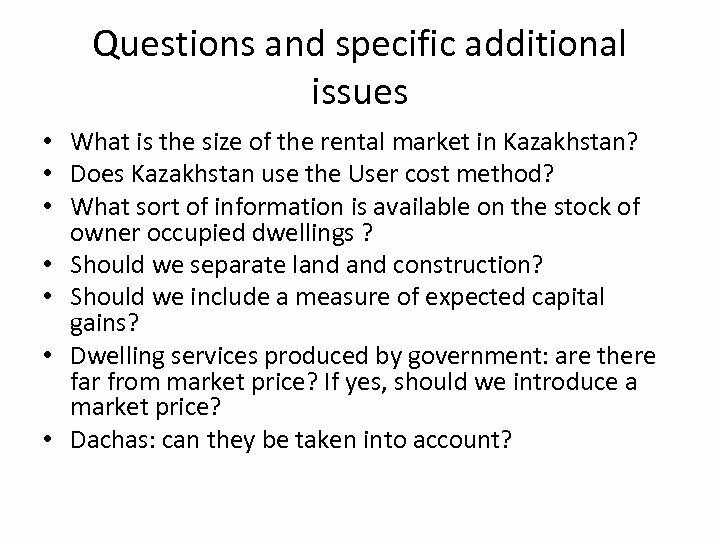 Questions and specific additional issues • What is the size of the rental market in Kazakhstan? • Does Kazakhstan use the User cost method? • What sort of information is available on the stock of owner occupied dwellings ? • Should we separate land construction? • Should we include a measure of expected capital gains? • Dwelling services produced by government: are there far from market price? If yes, should we introduce a market price? • Dachas: can they be taken into account?